This Hennessy bottle is the normal VS cognac with a different design. It’s been a while now since we’ve seen a new, funky street art Hennessy VS Cognac bottle. So the new limited edition created by artist, Ryan McGinness, is a great follow up to those already in the series by the likes of KAWS, Futura X, Os Gemeos and Shepard Fairey. 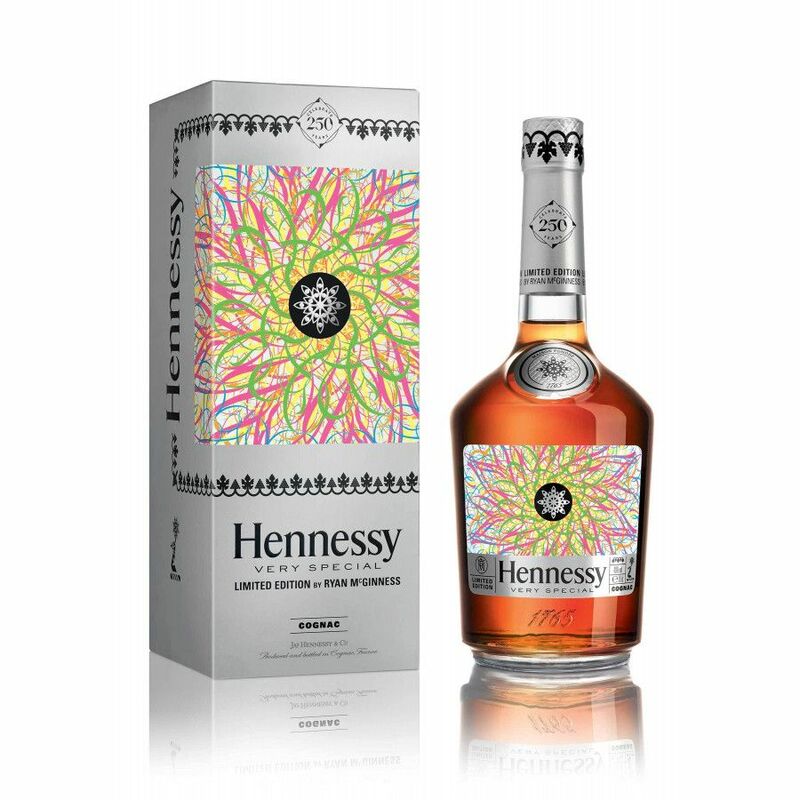 This particular cognac in the limited edition series has been created by internationally renowned contemporary artist, Ryan McGinness. It is the ‘black hole’, and he has, in his own inimitable way, managed to incorporate this beloved black hole and black light component into the new Hennessy VS design. It is the 5th in a series of collaborations with some of the world’s most acclaimed artists over the past 5 years. Each individually numbered bottle features a distinctive and colorful interpretation of the Hennessy V.S label based on McGinness’ “black holes” collection of paintings. With colors that glow under black-light on a silver background, the label also depicts his signature icons, symbolizing the craftsmanship of Hennessy Cognac. On August 6th, Hennessy celebrated the launch of this historic partnership with a event titled #ArtoftheChase in New York City. Guests entered through an interactive tunnel of digital McGinness artwork, and were greeted with Hennessy cocktails, including the “Infinity”, a recipe that the artist himself helped create. He was on hand to join the celebration and greet the crowd of VIPs, who filled the dance floor for a special performance by rapper 2 Chainz. In the weeks that followed, McGinness traveled the country with Hennessy, hosting special events and bottle-signings in LA, Miami, and Philadelphia. In all, the festivities surrounding the launch of Hennessy V.S Limited Edition by Ryan McGinness, provided a fitting tribute to the stunning bottle design, and the collaboration between kindred spirits — both McGinness and Hennessy share an enduring drive to Never stop. Never settle.